This type of dahlia is very popular with enthusiasts who love to have a good show of colour in the garden. The flowerheads are fully double and can range in size from miniature to giant, meaning that there will be a decorative dahlia to suit any garden. These dahlias have blooms with no central disc visible and the petals that are generally flat but may be a little curve. They can also be twisted, and usually have blunt ends. Decorative dahlias are very much in favour with those who like to attend exhibitions or enter shows and new varieties are always being produced. Corton Olympic – this is a giant flowered dahlia that produces flowers in excess of 25 cm or 10 inches wide. The flowers are orange, growing on strong stems that can reach a height of 1.3 metres or 4 ft. 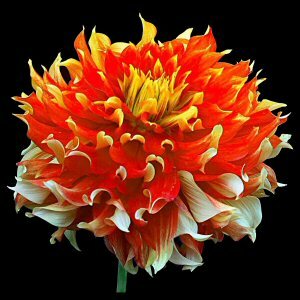 This dahlia is a good choice for exhibitions and shows. Davenport Honey – this is a miniature flowered decorative dahlia that produces flowers under 2 inches or 5 cm in width. The blooms on this plant are a vibrant amber colour, growing to a height of 1.2 metres or 4 ft. This is another good choice as a show specimen. Kidd’s Climax – this is a giant flowered dahlia, which produces flowers in excess of 25 cm or 10 inches wide. The blooms are an unusual pink that is tinged with a gold colour. The plant grows to 1.1 metres or 3 ft 6 inches in height.